I have always been fascinated with true stories about hope and peace. There's something very intriguing and special listening to stories about loved ones who are ailing and still finding peace and comfort from God, even at the end of their life's journey. That is why I especially loved reading "Glimpses from Heaven", by Trudy Harris. 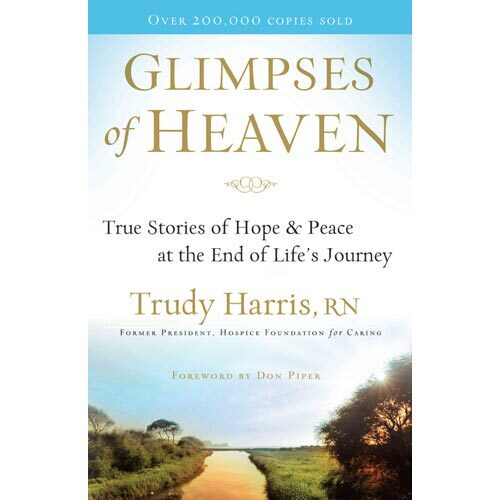 Trudy was a hospice nurse who has visited countless patients and witnessed their spiritual journey from life into death. The divine stories she shares from experiencing such beautiful moments is almost unexplainable but leaves you feeling honored to have shared such holiness through Trudy's experiences. What an amazing blessing for Trudy to be a part of people's lives in such a way that few people can ever imagine; and what a blessing for Trudy's patients to have had such an extraordinary hospice nurse gently and lovingly care for them and their families at the most meaningful time in their life. I hope you get a chance to read this beautiful book. It will quickly become very dear to your heart.